1. A thorough cleaning of the teeth can delay, or in many cases prevent cavities and periodontal diseases. We offer professional periodontal, dental, and cavity prophylaxis. Special care is given to our patients with dental implants for whom we have developed a special implant-prophylaxis program. 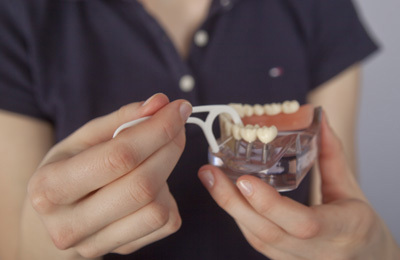 A general examination of your prosthetics is performed at the start of the professional cleaning along with an informative discussion including tips for proper oral hygiene. Next, plaque and tartar build-up is cleaned from the area beneath the gum line, the surface of, and between the teeth. Because bacteria affixes most easily to rough and cracked surfaces, we then scale and polish your teeth. At the end of the treatment, the cleansed teeth are coated with fluoride. This protects the surface of the tooth from the acid attack of bacteria found in the mouth.